Specific impulse (usually abbreviated Isp) is a measure of how effectively a rocket uses propellant or a jet engine uses fuel. By definition, it is the total impulse (or change in momentum) delivered per unit of propellant consumed and is dimensionally equivalent to the generated thrust divided by the propellant mass flow rate or weight flow rate. If mass (kilogram, pound-mass, or slug) is used as the unit of propellant, then specific impulse has units of velocity. If weight (newton or pound-force) is used instead, then specific impulse has units of time (seconds). Multiplying flow rate by the standard gravity (g0) converts specific impulse from the mass basis to the weight basis. A propulsion system with a higher specific impulse uses the mass of the propellant more effectively in creating forward thrust and, in the case of a rocket, less propellant needed for a given delta-v, per the Tsiolkovsky rocket equation. In rockets, this means the engine is more effective at gaining altitude, distance, and velocity. This effectiveness is less important in jet engines that employ wings and use outside air for combustion and carry payloads that are much heavier than the propellant. Specific impulse includes the contribution to impulse provided by external air that has been used for combustion and is exhausted with the spent propellant. Jet engines use outside air, and therefore have a much higher specific impulse than rocket engines. The specific impulse in terms of propellant mass spent has units of distance per time, which is a notional velocity called the effective exhaust velocity. This is higher than the actual exhaust velocity because the mass of the combustion air is not being accounted for. Actual and effective exhaust velocity are the same in rocket engines not utilizing air or other intake propellant such as water. Specific impulse is inversely proportional to specific fuel consumption (SFC) by the relationship Isp = 1/(go·SFC) for SFC in kg/(N·s) and Isp = 3600/SFC for SFC in lb/(lbf·hr). The amount of propellant is normally measured either in units of mass or weight. If mass is used, specific impulse is an impulse per unit mass, which dimensional analysis shows to have units of speed, and so specific impulses are often measured in meters per second and are often termed effective exhaust velocity. However, if propellant weight is used, an impulse divided by a force (weight) turns out to be a unit of time, and so specific impulses are measured in seconds. These two formulations are both widely used and differ from each other by a factor of g0, the dimensioned constant of gravitational acceleration at the surface of the Earth. Note that the rate of change of momentum of a rocket (including its propellant) per unit time is equal to the thrust. The higher the specific impulse, the less propellant is needed to produce a given thrust for a given time. In this regard a propellant is more efficient the greater its specific impulse. This should not be confused with energy efficiency, which can decrease as specific impulse increases, since propulsion systems that give high specific impulse require high energy to do so. Thrust and specific impulse should not be confused. The specific impulse is the impulse produced per unit of propellant expended, while thrust is the momentary or peak force supplied by a particular engine. In many cases, propulsion systems with very high specific impulse—some ion thrusters reach 10,000 seconds—produce low thrust. When calculating specific impulse, only propellant carried with the vehicle before use is counted. For a chemical rocket, the propellant mass therefore would include both fuel and oxidizer. For air-breathing engines, only the mass of the fuel is counted, not the mass of air passing through the engine. Air resistance and the engine's inability to keep a high specific impulse at a fast burn rate are why all the propellant is not used as fast as possible. A heavier engine with a higher specific impulse may not be as effective in gaining altitude, distance, or velocity as a lighter engine with a lower specific impulse. If it were not for air resistance and the reduction of propellant during flight, specific impulse would be a direct measure of the engine's effectiveness in converting propellant weight or mass into forward momentum. The most common unit for specific impulse is the second, both in SI contexts as well as where imperial or customary units are used. The advantage of seconds is that the unit and numerical value are identical across systems of measurements, and essentially universal. Nearly all manufacturers quote their engine performance in seconds, and the unit is also useful for specifying aircraft engine performance. The use of metres per second to specify effective exhaust velocity is also reasonably common. The unit is intuitive when describing rocket engines, although the effective exhaust speed of the engines may be significantly different from the actual exhaust speed, which may be due to the fuel and oxidizer that is dumped overboard after powering turbopumps. For airbreathing jet engines, the effective exhaust velocity is not physically meaningful, although it can be used for comparison purposes. The values expressed in N·s/kg are not uncommon and are numerically equal to the effective exhaust velocity in m/s (from Newton's second law and the definition of the newton). Specific fuel consumption is inversely proportional to specific impulse and has units of g/(kN·s) or lb/(lbf·hr). Specific fuel consumption is used extensively for describing the performance of air-breathing jet engines. The curious unit of seconds to measure the 'goodness' of a fuel/engine combination can be thought of as "How many seconds this propellant can accelerate its own initial mass at 1 gee". The more seconds it can accelerate its own mass, the more delta-V it delivers to the whole system. is the mass flow rate in kg/s (or slugs/s), which is the negative of the time-rate of change of the vehicle's mass (since propellant is being expelled). Isp in seconds is the amount of time a rocket engine can generate thrust, given a quantity of propellant whose weight is equal to the engine's thrust. The advantage of this formulation is that it may be used for rockets, where all the reaction mass is carried on board, as well as airplanes, where most of the reaction mass is taken from the atmosphere. In addition, it gives a result that is independent of units used (provided the unit of time used is the second). is the standard gravity (in ft/s2 or m/s2). In rockets, due to atmospheric effects, the specific impulse varies with altitude, reaching a maximum in a vacuum. This is because the exhaust velocity isn't simply a function of the chamber pressure, but is a function of the difference between the interior and exterior of the combustion chamber. It is therefore important to note whether the specific impulse refers to operation in a vacuum or at sea level. Values are usually indicated with or near the units of specific impulse (e.g. "sl", "vac"). is the standard gravity, 9.80665 m/s2 (in Imperial units 32.174 ft/s2). This equation is also valid for air-breathing jet engines, but is rarely used in practice. is the propellant mass flow rate, which is the rate of decrease of the vehicle's mass. A rocket must carry all its fuel with it, so the mass of the unburned fuel must be accelerated along with the rocket itself. Minimizing the mass of fuel required to achieve a given push is crucial to building effective rockets. The Tsiolkovsky rocket equation shows that for a rocket with a given empty mass and a given amount of fuel, the total change in velocity it can accomplish is proportional to the effective exhaust velocity. A spacecraft without propulsion follows an orbit determined by its trajectory and any gravitational field. Deviations from the corresponding velocity pattern (these are called Δv) are achieved by sending exhaust mass in the direction opposite to that of the desired velocity change. Note that effective exhaust velocity and actual exhaust velocity can be significantly different, for example when a rocket is run within the atmosphere, atmospheric pressure on the outside of the engine causes a retarding force that reduces the specific impulse, and the effective exhaust velocity goes down, whereas the actual exhaust velocity is largely unaffected. Also, sometimes rocket engines have a separate nozzle for the turbo-pump turbine gas, and then calculating the effective exhaust velocity requires averaging the two mass flows as well as accounting for any atmospheric pressure. For air-breathing jet engines, particularly turbofans, the actual exhaust velocity and the effective exhaust velocity are different by orders of magnitude. This is because a good deal of additional momentum is obtained by using air as reaction mass. This allows a better match between the airspeed and the exhaust speed, which saves energy/propellant and enormously increases the effective exhaust velocity while reducing the actual exhaust velocity. where ve is the actual jet velocity. Hence the power needed is proportional to the exhaust velocity, with higher velocities needing higher power for the same thrust, causing less energy efficiency per unit thrust. However, the total energy for a mission depends on total propellant use, as well as how much energy is needed per unit of propellant. For low exhaust velocity with respect to the mission delta-v, enormous amounts of reaction mass is needed. In fact a very low exhaust velocity is not energy efficient at all for this reason; but it turns out that neither are very high exhaust velocities. 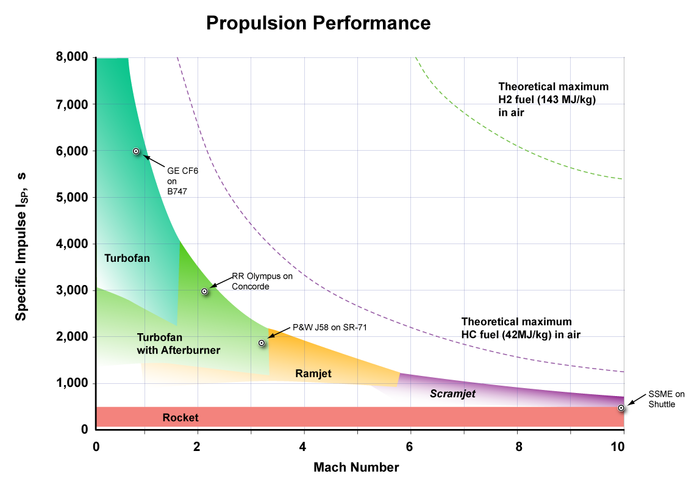 is the most energy efficient for a specified (fixed) final mass, see energy in spacecraft propulsion. However, a variable exhaust speed can be more energy efficient still. For example, if a rocket is accelerated from some positive initial speed using an exhaust speed equal to the speed of the rocket no energy is lost as kinetic energy of reaction mass, since it becomes stationary. (Theoretically, by making this initial speed low and using another method of obtaining this small speed, the energy efficiency approaches 100%, but requires a large initial mass.) In this case the rocket keeps the same momentum, so its speed is inversely proportional to its remaining mass. During such a flight the kinetic energy of the rocket is proportional to its speed and, correspondingly, inversely proportional to its remaining mass. The power needed per unit acceleration is constant throughout the flight; the reaction mass to be expelled per unit time to produce a given acceleration is proportional to the square of the rocket's remaining mass. Also it is advantageous to expel reaction mass at a location where the gravity potential is low, see Oberth effect. For a more comprehensive list, see Spacecraft propulsion § Table of methods. An example of a specific impulse measured in time is 453 seconds, which is equivalent to an effective exhaust velocity of 4,440 m/s, for the Space Shuttle Main Engines when operating in a vacuum. An air-breathing jet engine typically has a much larger specific impulse than a rocket; for example a turbofan jet engine may have a specific impulse of 6,000 seconds or more at sea level whereas a rocket would be around 200–400 seconds. An air-breathing engine is thus much more propellant efficient than a rocket engine, because the actual exhaust speed is much lower, the air provides an oxidizer, and air is used as reaction mass. Since the physical exhaust velocity is lower, the kinetic energy the exhaust carries away is lower and thus the jet engine uses far less energy to generate thrust (at subsonic speeds). While the actual exhaust velocity is lower for air-breathing engines, the effective exhaust velocity is very high for jet engines. This is because the effective exhaust velocity calculation essentially assumes that the propellant is providing all the thrust, and hence is not physically meaningful for air-breathing engines; nevertheless, it is useful for comparison with other types of engines. The highest specific impulse for a chemical propellant ever test-fired in a rocket engine was 542 seconds (5,320 m/s) with a tripropellant of lithium, fluorine, and hydrogen. However, this combination is impractical; see rocket fuel. Nuclear thermal rocket engines differ from conventional rocket engines in that thrust is created strictly through thermodynamic phenomena, with no chemical reaction. The nuclear rocket typically operates by passing hydrogen gas through a superheated nuclear core. Testing in the 1960s yielded specific impulses of about 850 seconds (8,340 m/s), about twice that of the Space Shuttle engines. A variety of other non-rocket propulsion methods, such as ion thrusters, give much higher specific impulse but with much lower thrust; for example the Hall effect thruster on the SMART-1 satellite has a specific impulse of 1,640 s (16,100 m/s) but a maximum thrust of only 68 millinewtons. The variable specific impulse magnetoplasma rocket (VASIMR) engine currently in development will theoretically yield 20,000−300,000 m/s, and a maximum thrust of 5.7 newtons. ^ a b "What is specific impulse?". Qualitative Reasoning Group. Retrieved 22 December 2009. ^ a b c Benson, Tom (11 July 2008). "Specific impulse". NASA. Retrieved 22 December 2009. ^ "Mission Overview". exploreMarsnow. Retrieved 23 December 2009. ^ Thomas A. Ward (2010). Aerospace Propulsion Systems. John Wiley & Sons. p. 68. ISBN 978-0-470-82497-9. ^ Note that this limits the speed of the rocket to the maximum exhaust speed. ^ ARBIT, H. A., CLAPP, S. D., DICKERSON, R. A., NAGAI, C. K., Combustion characteristics of the fluorine-lithium/hydrogen tripropellant combination. AMERICAN INST OF AERONAUTICS AND ASTRONAUTICS, PROPULSION JOINT SPECIALIST CONFERENCE, 4TH, CLEVELAND, OHIO, June 10–14, 1968. ^ ARBIT, H. A., CLAPP, S. D., NAGAI, C. K., Lithium-fluorine-hydrogen propellant investigation Final report NASA, May 1, 1970. ^ Nathan Meier (21 March 2005). "Military Turbojet/Turbofan Specifications". ^ A hypothetical device doing perfect conversion of mass to photons emitted perfectly aligned so as to be antiparallel to the desired thrust vector. This represents the theoretical upper limit for propulsion relying strictly on onboard fuel and the rocket principle.